l Use the Shift key. Pressing the Shift key (both Mac and Windows) constrains proportions (maintains the width-to-height ratio) while you drag. With the Shift key, the Rectangle tool creates squares; the Ellipse tool creates circles; the Polygon tool creates proportional polygons; the Line tool creates horizontal or vertical lines (or lines at 45° angles). When using custom shapes, pressing the Shift key ensures that the shape retains the width-to-height ratio with which it was originally defined. l Use the Option (Mac) or Alt (Windows) key. The Option/Alt key creates the object centered on the point at which you click. Without the Option/Alt key, the object is created in whichever direction you drag. l Use the Shift and Option/Alt key. Pressing the Shift and Option/Alt together helps you create a proportionally constrained object, centered on the point at which you click. Figure 11-4: The shape tools are collected in one spot in Photoshop's Toolbox. i Use the spacebar. While you're dragging a shape, keep the mouse button down and press the spacebar on the keyboard. You can then drag to reposition the object while you create it. Still keeping the mouse button down, release the spacebar and finish dragging the object. i Check the Options bar. When you switch from shape tool to shape tool, the Options bar changes to fit your needs. For example, with the Rounded Rectangle tool active, you choose the radius of the rounded corners. The Polygon tool offers a simple field in which you choose the number of sides for the shape. When you're using the Line tool, choose the thickness (weight) of the line in the Options bar. And click the triangle to the right of the shape tool icons in the Options bar to add arrowheads to the lines. i Change the layer content. After you create a shape layer, you can change the color of the layer to another color, to a gradient, or even to a pattern. Use the menu command LayerOChange Layer Content. i Edit the vector path. As you can see later in this chapter ("Adding, deleting, and moving anchor points"), you can use the Direct Selection tool to change the course of the path, altering the appearance of the shape layer and, therefore, the shape of the object on the shape layer. You can easily spot a shape layer in the Layers palette — especially when the default layer name starts with the word Shape. (You can, of course, change the layer name by double-clicking it in the Layers palette.) 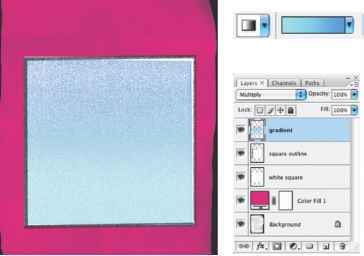 You can see in the Layers palette shown in Figure 11-5 that the shape layer consists of a color-filled layer (the thumbnail on the left) and a vector layer mask (the thumbnail on the right). That vector mask (a rounded rectangle path, in this case) is also visible in the Paths palette when the shape layer is selected in the Layers palette. If you click the Background layer in the Layers palette, the Shape 1 Vector Mask in the Paths palette is hidden.